Steven Goddard, in explaining why women consistently show stronger support for President Obama than men, comments. Many people with feminine personalities fall into co-dependency, and are satisfied by ridiculous lies in a thoroughly abusive relationship. That is a bit strong. In modern terminology, women tend to network more than men. In older terminology, they like to gossip and form opinions on the basis on their social interactions. Such characteristics help hold social units together, but do make women more prone to being won over by emotive arguments that males. But women in abusive relationships have very low self-esteem being continually told that they are inferior. The men in their lives tell them that their opinion does not count. Any signs of questioning are rebutted verbally, emotionally and physically. The greatest abusers tend to be the biggest liars and the most emotionally inadequate. In more traditional, male-dominated communities such abusers claim legitimacy from that society for practices (such as adultery) that it would not condone. Unfortunately the traditional male-dominated churches have used alleged biblical authority to support the male-abusers in marriage, and even to excuse or down-play paedophilia. In terms of climatology, claims of superiority of climate scientists have some parallels with these abusing and hate-filled men. Supporters of climate consensus claim that deniers are psychologically inferior and totally incapable of understanding the world around them. They stamp down on any dissent with spurious reasons, such as alleged funding by big oil, yet do not admit to their own funding, nor (and far more dangerously) their own very dogmatic belief systems. They claim the authority of science, but never define what science is, nor how their dogma fits into the best traditions of science. There are increasing exceptions to the feminine submissiveness. The late Margaret Thatcher is the most extreme. She had a strong sense of values and phenomenal determination to pursue those values. But Thatcher also considered and vigorously questioned any briefings before making decisions. If a case could be made she would change her mind. This may in part be due to a traditional training in science. It is part also due to a feminine side of empathy with opposing points of view. This feminine trait of talking to other people and listening to different views might explain why although all sides of the climate argument are dominated by men, the most prominent climate bloggers women are sceptical. This includes Joanne Nova, Donna Laframboise, Judith Curry and Lucia. Before someone points out some women alarmists blogs, their respective Alexa rankings are currently 149873, 883955, 393802 and 619501. The BBC gave headline news today about a FOI request by Phillip Morris about Government funded research. The Guardian and Telegraph joined in as well. This is a comment left at Bishop Hill. There are some legitimate reasons why a cigarette company (and the general public) might want to know more details of a research study. This is Government-funded research to justify legislation, without counter-studies for balance. Bearing in mind that the study was of 6,000 young people, who the Professors believe are highly impressionable from marketing. 1. Were the questions neutral and held in a neutral venue? 2. Did the resulting peer-reviewed article draw conclusions that the data substantiates? Are they statistically significant? 3. Can other conclusions be drawn by the data? a) The two professors who did the study have PhDs in marketing and in social policy. b) The study is not about the health affects of smoking. It is about justifying compulsory neutral packaging for cigarettes. c) This particular study is very difficult to find on the internet, and is not listed on either of their websites amongst the publications. One has a list of over eighty. One of the Professors was co-author of a similar study (only with adults), which got an unfavourable review in the Guardian. This time the sample size was 43, divided into 3 distinct groups. The level of research into the harm smoking can cause is considerable and of high quality. The original British Doctors Study than confirmed the link between both lung cancer and coronary thrombosis was ground-breaking statistically. That does not mean that all the policy research is of a similar quality. It is my belief Government social policy should aim at the net improvement of society. That implies that in funding research into social policy there is a duty of care to ensure balance, and that conclusions are robust. There are very legitimate reasons that this line of research falls short. Please, please, Mr Cameron can you rise above the thinking of the Labour government? On my ‘O’ Level economics course I learnt that raising taxes on booze was a good way of raising revenue, as demand is inelastic with respect to price. This is still true, so to plug the budget deficit they could look to raising the tax. The other side of the coin is that it is a poor way to reduce consumption. For young people it may have more of an impact of their expenditure on alternatives (alcohol in pubs or nightclubs, clothing or car expenditure, or saving). For some it may be a Giffin good. Their consumption will increase on booze at home, and they will spend less on going out. Minimum price is even worse. You may get people going up market,as the differancial between white cider and better alternatives diminishes. Also the quality may improve. But what will increase massively in the profit per unit to the retailer. Supermarket and Off-licence shares might rise is this is pursued. The social problem of alcohol will not be solved by stricter laws or by higher price. It needs a social change. It is only when large numbers of people stop believing that the best way to have a good time is to get totally pissed; and when it is seen as a weakness to lose control of one’s faculties. Then the consumption and the binge drinking will go down. The Adam Smith Institute similarly see this as a social problem. A Home Affairs Select Committee has urged an end to happy hours and a minimum price for alcohol, according to the BBC. The figures for costs of alcohol should be measured against the per capita income. Norway may have the highest alcohol prices in Europe, but it is also has per capita income nearly double that of the UK. Relative to income alcohol is no more expensive than in the UK. When considering putting the price of alcohol up, please also remember that it is inelastic with respect to price. That is a very large increase in price is needed to get a small drop in demand. It is thus a great way to increase tax , but a poor way to reduce consumption. 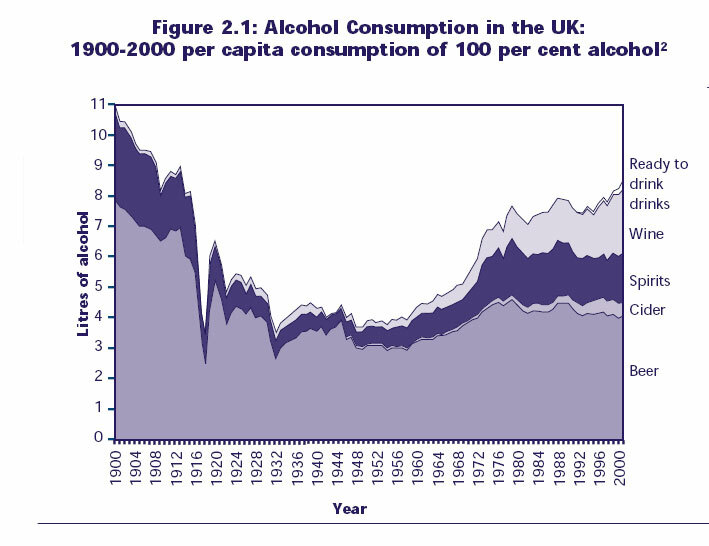 The graph of the last century of alcohol consumption is very revealing. In the early part of the twentieth century, the sharp fall in alcohol coincided with a religious revival and the temperance movement. It was started in the nineteenth century by organisations such as the Salvation Army and the Methodists. In other words, it was a massive cultural change, where it became socially unacceptable to even touch alcohol. The steep decline in religion in the post war period was accompanied by the rise in alcohol consumption. Is this a fiscal solution being proposed to a cultural problem. The outcome of a minimum price will be monopoly profits for the supermarkets and the booze companies. It is true that a lot of crime is committed by those intoxicated, but the solution is not to increase the price of alcohol. The solution is to change people. The Revival of the early twentieth century, (begun before the outbreak of the Great War in 1914) saw both a fall in alcohol consumption and a fall in crime levels, that continued through the Great Depression. But it was not lack of alcohol that reduced crime, but a common root in the Christian Faith. The posting of yesterday failed to get through the BBC filters. Don’t know if was the positive message about religion, or the powerlessness of government. Let us see if this one gets through. Mark Easton fails to pick up the most important point of alcohol consumption over the last century. It fell from 1900 to 1932, stabilised until around 1960, then shot up to around 1980. The government influences (licensing laws and tax rates) cannot account for these dramatic changes. For this reason alone, changing licensing laws and imposing a minimum price will not have much impact. Here is the graph mentioned in the above report. Please tell me if I have missed anything. I remember (not personally, you understand) that the licensing laws were made more draconian during the Great War, which can account for some of the steeping of the reduction. Also, as men used to drink far more than women, and younger men more than older men the loss of nearly a million men, (5% of the adult male population) would account for some of the slide as well. But take the 1900 to 1914 trend through to 1930 and you still have a fall of over 50%.